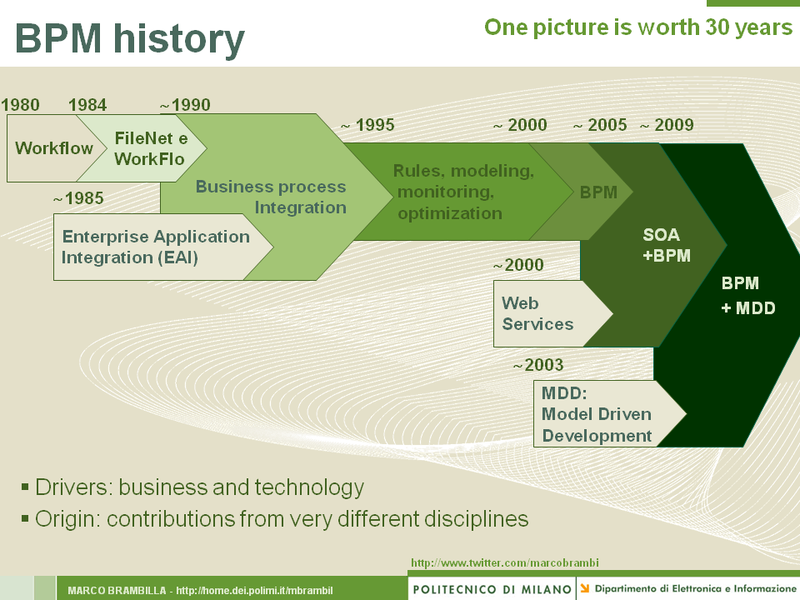 Starting from various sources and disciplines, I have built up a pictorial representation of BPM history in the last 30 years. I know, it’s shallow and incomplete, but I think it makes some good points. For me BPM + MDD sounds a bit strange. Isn't BPM an application of MDD? In your picture you already talk about Rules, *modeling*, monitoring and optimization in 1995, way before BPM + MDD. See also this post: when do you call something MDE / MDD? you are right, the picture is necessarily very rough. The last step I put in (BPM+MDD) was meant to show the convergence of two fields that traditionally were basically disjoint (I'm sure that BPM people never heard about MDD-MDE before last year). The “rules” that appear in the 1995 slice are meant to be Business Rules, not transformation rules à la MDE. At that time, in the BPM field, modeling itself was assigned a mere role of description/documentation, without any “engineering” aspect. These are the reasons that made me schematize the story as you see it.